The lightweight 110 volt sander is available by abrasives specialist Mirka, enabling builders and construction workers to sand on site effectively. 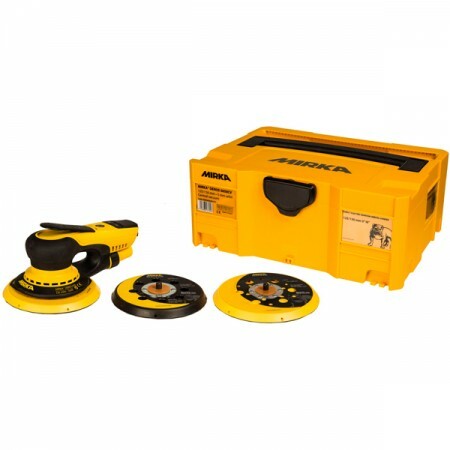 The 110v DEROS comes as standard in a yellow Mirka case with 125 mm and 150 mm backing pads. A Deco Solution Kit is also available and includes the standard 110v DEROS sander plus a four metre hose and a variety of the patented Abranet 150 mm discs in packs of 10. The DEROS sander plugs into a 110v power supply allowing users to meet site regulations. It is suitable for multiple sanding operations delivering a rapid, economical, consistently powerful performance comparable to a conventional 500W electric machine, even under heavy load. The sander has a Ôclosed constructionÕ which prevents dust from entering the motor, avoiding typical wear and tear damage experienced by electric machines, prolonging its lifespan and making it low maintenance. DEROSÕ low profile keeps the hand close to the surface to be sanded, delivering good control over the sanding process. Its long body encompasses a two-hand ergonomic grip effective for heavy sanding applications, minimising vibration levels and reducing arm fatigue, which decreases the risk of Hand Arm Vibration Syndrome. The sander also has a soft start function, a built-in electronic motor brake and a smooth, easy to operate level to control and maintain a constant motor speed. An innovative backing pad acts like a seal to minimise air leakage between the pad and the shroud, making dust extraction more efficient. As with all Mirka electric sanders the 110v DEROS comes with a 2+1 year warranty when registered online. Paired with the Mirka 915 110v Extractor this makes the perfect dust free, site safe and ready sanding kit. If you would like a price on a full Kit with a Mirka 915 Extractor please call our office and one of our team will be happy to help.